A fun brunch dish, these breakfast tacos are crowd-pleasing and can be prepared in advance. Preheat the oven to 170F. Heat the olive oil in a medium sauté pan and tumble in the sweet pepper. Sauté for 4-5 minutes until softened, but still bright in colour. Season lightly with a pinch of salt and transfer to a bowl. Place in the warming oven to hold. Add the sausages to the pan and cook for 5-7 minutes or until lightly browned and crispy around the edges. Transfer those to a bowl as well and keep warm. Add the beans to the pan, sprinkle with cumin and 1/2 teaspoon of salt. Cook them only until they are warm and the transfer to the oven. Wash and dry the sauté pan and return it to the stove. Lightly beat 6 eggs in a bowl with a pinch of salt and 2 tablespoons of water. Melt butter in the pan and pour in the eggs. Cook over low heat, stirring frequently, until the eggs are scrambled. Transfer to a serving bowl. Wrap the tortillas in a clean tea towel and microwave for a minute or two until hot. 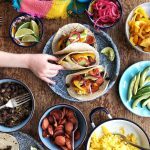 Assemble everything together at the table: corn tortillas, sweet peppers, chorizo, beans, scrambled eggs, avocado, cheese, pickled red onion, salsa and lime wedges. Let everyone assemble their own tacos and enjoy warm. You can use Mexican chorizo instead, which is usually cut from the casing, crumbled and fried.